Lane P. The hostel was really big with lots of families and not just your typical backpacker. Rooms were really nice - great shower and toilet, lockers, comfortable beds. Kitchen and common bathrooms good as well. The staff were really rude though and had no customer service. Wasn’t told where my room, kicthen, bar etc were. Wasn’t told about checkout, wifi, anything. Not very friendly feeling from the staff. Overall it would be a great introduction to hostel life if you’ve only stayed in hotels and the like. Definitely didn’t have a hostel feel. Also nice and close to Brick Lane markets and the tube and the river. Stephanie I had a wonderful night's stay at Wombats London. The entire hostel was very tidy and I felt instantly at home. My room was perfect, and the bathroom especially was so nice. The front desk was very helpful with any questions I had too. I have never stayed at a hostel that had so many families and middle aged and even on the verge of elderly folks. They seemed nice but it really does change the vibe of what I thought hostels were about, young travelers trying to keep it in a budget, it just feels weird sleeping in a dorm room with someone my dads age. Also there was a woman in the kitchen that I’m not sure if she was supposed to be there. Seemed like maybe she was but had so many bags was walking around barefoot and was trying to feed food to pictures on the walls while having conversations with them. Seemed harmless but not sure id want to share a room with her. She was well over the usual age limit of the hostels I’ve stayed in Otherwise had very cool hangout areas which the weather had been better to use the outdoors, loved the location and the amenities. Biggest issue was having one shower for eight people. I had to wait for four people to shower before I could get in, so I had to leave much later than anticipated. Jack Lovely stay. One of the nicest hostels I've used. The bar staff were outstanding, food was delicious. Very reasonably priced. Lad on the desk was a miserable fucker on arrival but he might have been having a bad day. Would 100% recommend. Paulo E. Amazing experience. I Will defintly share me time in the hostel. Cj H. Everything is great expect the shower. The shower is not hot enough to wash away the lassitude. Austin I loved it. The rooms were clean, and very nice. I loved how the bar down stairs was there and allowed everyone to come together and hang out. I’ll definitely be coming back. Vanesa W. Everything was great a d comfortable. The staff was nice and helpfull too. But, sometimes the kitchen was very dirty and one day a nice bag of my friend that was in the fridge disappeared. Finally, in the rooms the international charger doesn't fit. Luckily we could use de usb port. David Worst hostel in London I have ever stayed in! Marisa I was excited about this hostel because the location near tower bridge, my favorite spot in London was ideal. But my experience however was incredibly disappointing. There was no hot water for 80% of my stay and the “hot” water when it eventually DID turn back on was *just* warm enough to shower in. Most of the people in my room ended up leaving and demanding a refund. I wish I had been that smart. The staff feigned ignorance for several days and then kept telling me that it had either been fixed or they were working on it. Also my mattress had a stain and one of the beds in our room was incredibly creaky. Also there is no hot water at all for the sinks so my face and hands are now unbelievably dry. Not to mention you have to make and unmake your own beds yourself... 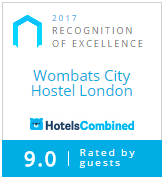 I am not sure why this hostel has the high rating that it does but after this experience... I’m hoping my fellow hostellers also leave reviews. Maria D. L. A. M. You didn’t have hot water during my entire stay. And you know it before I checked in. Gosia Everything was amazing! Very friendful and helpful staff, they help with everything. Very clean rooms and toilets, it's amazing that in my room was bathroom, toilet in another room and sink in room. It helped very at morning when everyone waked up. I love this small shelf, light and usb charger in bed (the best solution I've seen in hostels). I felt very safe at this place, (to entry was needed card, no stranger walked around the hostel). Also i like the bar and beer in your hostel 🙂 I will recommend to everyone! Sofia Staff was friendly, room was nice and clean. No hot water though, other than that, quite nice. Breakfast was pretty good for hostel and not too pricey. Brenna W. The hostel was clean but I didn’t necessarily feel welcomed by staff, the water was ice cold my entire stay (even when I showered in the non busy hours) and you can hear absolutely everything and everyone all night from the bar or rooms in the same hall if you’re staying in the garden rooms. But on the bright side it’s in a great location- LOVED the location and the rooms were clean. I stayed in the hostel 2 years ago and was very happy with it. Recommended it to several friends. But this time it was a nightmare. Got a room in the basement, small, hot, right next to the smoking corner, and insanely loud all night(must have been next to a machine room or sth.). Mattress was filthy and worn out.No WIFI during my entire stay (3 days).On top I was lucky to have some dirty and annoying roommates (not the hostels fault, I know). So I haven't slept much, plus I had insane back pain caused by the bed, which made walking almost impossible. Great for a city trip. Had to go to the doctor, still in pain a week later. Never again. Marvin R. Mein Aufenthalt lief problemlos und sicher ab. Die Mitarbeiter an der Rezeption waren stets freundlich und bemüht und haben bei allen Fragen und Problemen eine gute Hilfe geboten.